Take 80% Off with every order of $25 Gift Certificates with code LUCKY and pay $2 thru 4/30/09. This article from Yahoo lists a number of discount promotions that various retailers and restaurants are offering. You can get 15% off at PF CHangs. Cinnabon has FREE cinnamon-roll bites from 5PM to 8PM. McCormick and Schmick's has a $10.40 entree menu. 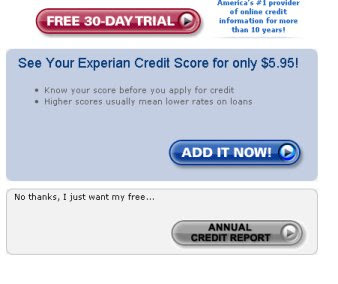 Check out the Yahoo article for other deals. On my post "Home foreclosure rates past and present. 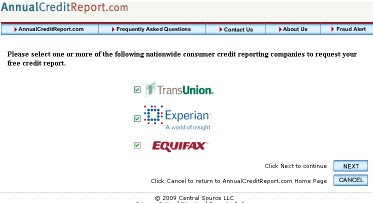 ", a commenter, Randy, asked about historical home ownership rates versus foreclosure rates. 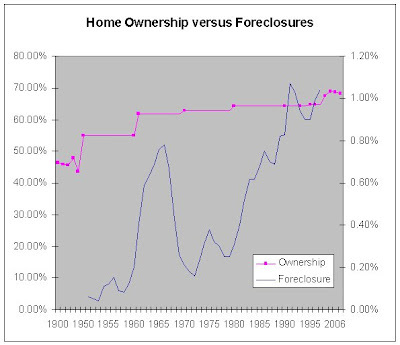 "Have you looked at foreclosure rate graphed with home ownership rates? My understanding is that home ownership reached new highs in the last few years, I would think foreclosure rates would have followed (but delayed)." First lets look at historical home ownership rates. You can see that from 1900's to the 1940's the rate was fairly stable in the 40% range. 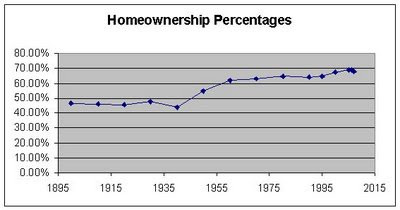 Then from 1940 to 1960 home ownership increased substantially and jumped up to the 60% level. From 1960 until today the home ownership rate has been in the 60% range and has gradually gone up over the decades. Note that most of the census data is only for 10 year intervals so it doesn't show every year. I could probably find some more data for individual years by pulling it out of historical statistical abstracts but I doubt that there was much variation in home ownership for any given 10 year period. How does the home ownership rate compare to the foreclosure rate? Below I've charted the rate of foreclosures versus the home ownership rate. The home ownership rate is the pinkish line with the figures on the left column. 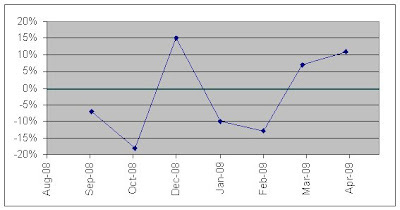 The foreclosure rate is on the blue line with the figures on the right column. Both have been generally trending upwards over time. Given the data I looked at, I don't see any direct relationship between home ownership rates and foreclosure rates. Now this is not to say that there isn't any relationship between the two. Obviously if you gave everyone in the country a home that they couldn't afford then there would be 100% home ownership but the foreclosure rates would increase. Another thing to consider is that the data on home ownership rate doesn't tell us how affordable those homes and it doesn't tell us how many people have mortgages. Home ownership alone doesn't really give us a good predictor for foreclosure rates. What if 75% of us owned homes but only 10% of those people had a mortgage and the rest owned the homes outright? What if 50% of us owned homes and 90% of us had mortgages? I think that such things as the affordability of the homes in relation to wages, the level of equity in homes, and general economic conditions would probably show more direct relationship to foreclosure rates than simple home ownership rates. Diamonds are pretty. Diamonds make great jewelry and most of us will end up giving or getting a diamond ring sometime in our lives. While they make great jewelry, diamonds do not make good investments. There are a number of reasons that diamonds do not make good investments. The BIG problem with diamonds as an investment is that there is no public market in them. You can't simply go to your local stock broker or bank and cash in your diamonds. In order to sell a diamond you'll have to go to a jeweler or pawn broker. When you buy the diamond you are normally paying a retail price. So the diamond has a mark up in the price you pay above wholesale. Then when you sell the diamond you will get quoted a price below wholesale so that the buyer can make a profit and then resell at wholesale value. The article Have You Ever Tried to Sell a Diamond? from The Atlantic in 1982 discusses the whole diamond business and how investing in diamonds is difficult. "in 1970, the London-based consumer magazine Money Which? decided to test diamonds as a decade long investment. It bought two gem-quality diamonds, weighing approximately one-half carat apiece, from one of London's most reputable diamond dealers, for £400 ... tried to sell the diamonds in 1978 ... 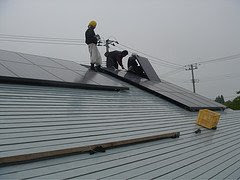 Most of the stores refused to pay any cash for them; the highest bid Watts received was £500, which amounted to a profit of only £100 in over eight years, or less than 3 percent at a compound rate of interest. If the bid were calculated in 1970 pounds, it would amount to only £167." So over 8 years they saw 3% gain without considering inflation. Not particularly good. This quote also gives us an example price from 1970 we can compare to today's prices. We can do a quick compare to see how those 1970 prices compare to today's prices. They bought two half carat diamonds for £400. That is about $584 in today's exchange rate for about $292 for a 0.5 ct diamond. Today I searched BlueNile and Amazon for loose diamonds. The cheapest 0.5 ct. diamonds I found were $573 on BlueNile and $465 on Amazon. 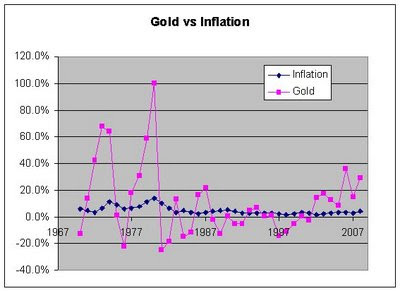 Going from $292 in 1970 to $573 today is a 1.7% rate of increase over 39 years. Then they also say: "For example, Brod estimates that a half-carat diamond ring, which might cost $2,000 at a retail jewelry store, could be sold for only $600 at Empire." (keep in mind that article was written in 1982). That would have been a 70% loss in value between buying and selling. 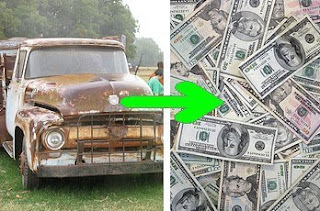 For something more recent, Yahoo has an article The Great Used Gold Rush of 2009 that talked about people selling their old jewelry and gold. They say that resell on a 1 carat diamond ring : "Of course, what you can expect to be paid will always depend on the diamond, but for an average near-colorless and slightly imperfect stone, expect close to $1,000 or more." If you were to go and buy a 1 carat ring today you'd spend at least $1500 but more commonly closer to $2500-$3000 range. The very cheapest 1 ct. loose diamond I found was about $1400 on Amazon and 1 ct. diamonds started at over $2200 on BlueNile. 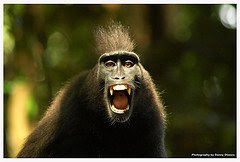 So you're talking about buying a ring for $1400 to $3000 and its resale value being around $1000. Right off the top you're losing 25-66% of the purchase value. Another major concern with treating diamonds as an investment is that the entire world diamond market is manipulated and controlled to some extent by the De Beers cartel. 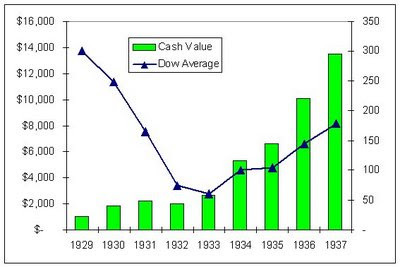 This means that the prices paid for diamonds are artificially influenced by DeBeers. Why is this a concern? The DeBeers cartel is artificially inflating diamond prices to suit their own interests. At any time its possible that another entity could develop their own diamond source and undercut DeBeers and this would then cause the entire market for diamonds to be impacted. I do not think it is too likely that DeBeers will lose their grip on the diamond market but it is a possibility. You have to pay a markup when you buy and get a discounted price when you sell. Long term gains have been single digit % levels. The entire market is controlled by a cartel. Generation X Finance points out that March 2009 Was a Perfect Example of Why You Shouldn’t Try to Time the Market Its good article to read if you're worried about you're starting to get nervous about the "buy and hold" strategy. 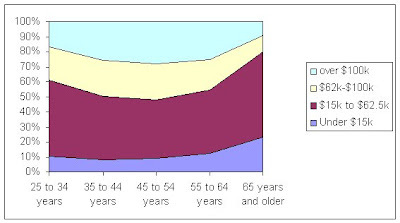 The Census site has data on household income by age of householder. 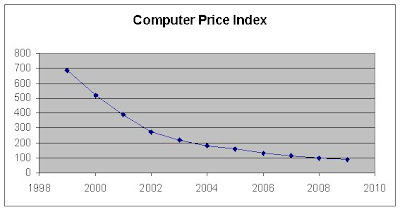 The data there is from 2007 so its fairly recent. It is interesting to look at typical income levels for people of various age groups. Current median income rises are higher for people in older age groups through their 20's, 30's, 40's and 50's. 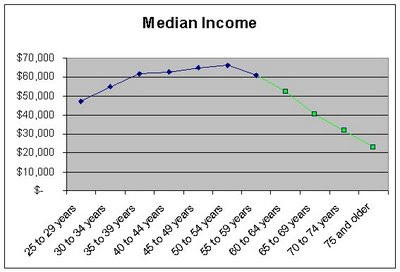 Then as people hit their late 50's and get above the older they are the lower the median income are. Remember this is just a snapshot of one year. It doesn't follow an individual. So I would not necessarily look at this data and conclude that peoples incomes go and down in this similar plotline as shown in the graphic. I would not assume for example that your income will go down as you age after retirement. Its possible that people in later years have fixed income or incomes that increase at a slower rate and are working less and less. So simply compared to younger people their incomes look lower since they have been increasing at a slower pace over decades. On the other hand people of working age are getting annual raises and gaining more work experience and gradually getting other sources of income. Whatever the cause, its obvious that people in retirement age typically have lower income levels than people of working ages at any given time. In fact if you compare median income of people above 65 to people below 65 the difference is pretty significant. People under age 65 have a median income of $56,545 and people over age 65 have a median income of $28,305. While the median tells us where the middle income level will be its also good to look at how income is distributed for each given age group. I figure one good way to do that is to break income into groups that roughly equate to the federal income tax brackets. So using the 2007 tax brackets for a married couple I broke income levels into 4 groups. People making under $15,000 which roughly equates to the 10% bracket, people making between $15,000 and $62,500 which is about the 15% tax bracket, people making from $62,500 to $100,000 which falls into the 25% bracket and then finally people making over $100,000 which is everyone else including the top part of the 25% bracket and up. Now lets look at how the income of people of different ages falls into these groups. While the largest income group for either age is in the middle, the people over 65 are more often in the lower group and people under 65 are more often in the higher group . People over 65 years old make under $15,000 twice as often as people under 65. 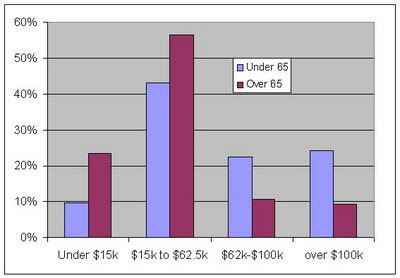 People over 65 make over $65,500 half as often as people under 65. People in their early ages are more often making lower income compared to people in their 40's and early 50's. But by the time that people hit their 50's and 60's or older they are more often making lower incomes. Since these income levels are roughly divided to coincide with the tax brackets we can see a rough picture of how people of different ages fit into different tax brackets. 80% of people over 65 are in the 10% & 15% brackets and only 20% of them are in the 25% and higher brackets. 53% of people under 65 are in the bottom 10% & 15% brackets while 47% are in the 25% and higher brackets. Looking at the actual income distributions for age I would conclude that in general people are more often in lower tax brackets when they are retired. Notice I've got the words 'in general' in italics above. The data represents medians which is a indicator of where the middle falls. It is important to keep in mind that median numbers aren't any real indicator of what we as individuals will see for ourselves. Each of us is different so our individual income picture in the past, present and future will vary. In short, just because retired people are typically in lower tax brackets doesn't mean you will be too. In the good news category there are 11 states under 6% unemployment. The best off are: Wyoming 3.9%, Nebraska 4.2%, North Dakota 4.3%, South Dakota 4.6%,Iowa 4.9%, Utah 5.1%, New Hampshire 5.3%, New Mexico 5.4%, Oklahoma 5.5%, Louisiana 5.7%, Kansas 5.9%. The data is from the Bureau of Labor Statistics. There is a graphic map of the nation with each state's unemployment rate.